One of the doctors who blew the whistle on National Women’s Hospital’s ‘unfortunate experiment’ has written about his experiences in an attempt to set the revisionist history straight. 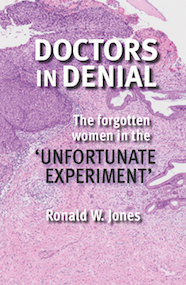 Ron Jones was a junior obstetrician and gynaecologist when he joined National Women’s Hospital in 1973, by which point Professor Herbert Green was well into his study that has since become infamously known as the ‘unfortunate experiment’. In brief, from the mid-1960s Green opted to give minimal care to women who presented at the hospital with carcinoma in-situ (CIS): a lesion that is now known to lead to cervical cancer in a proportion of cases [terminology has changed over the years, it’s now called cervical intraepithelial neoplasia or CIN]. Green’s theory was that CIS and cervical cancer were different entities, and that women were being subjected to unnecessary procedures, including hysterectomy, without due cause. The trouble was, even in the 1960s when Green was heading down this path, international opinion was already convinced that CIS was a pre-cursor to cervical cancer. It was why there was a push toward national cervical screening programmes overseas, following the introduction of the Pap smear test in the 1950s-60s, with the idea that by catching and removing it early it could be possible to prevent cervical cancer entirely. When some of Green’s patients began developing cervical cancer, rather than admitting his theory was wrong and stopping the experiment, he continued. In some cases, doctoring their records to show they’d had cancer all along rather than CIS. Senior staff at National Women’s Hospital, who could have put a halt to it, didn’t. Even following a 1984 publication, by Jones and two colleagues – Bill McIndoe and Jock McLean – exposing the true results of the experiment, it took two determined women writing in Metro to draw the deserved attention to the appalling treatment of women in Green’s care. Now retired, Jones has written Doctors in Denial to combat the revisionism since the 1987 public inquiry, which found Green had conducted an unethical experiment on the women he was obligated to look after. Despite the clear finding, what really happened at National Women’s has been turned over time and again, with some lauding Green’s motives and calling the response a feminist witch-hunt. Jones pulls no punches: the experiment was unethical and should have been stopped by those in authority; or quite possibly never have been allowed to begin in the first place and certainly not in the form Green proposed, which was missing key safe-guards to protect the women. The detail of what Green did is difficult to read, at times, but is an essential part of the story that Jones ensures isn’t left out. It’s particularly skin-crawling to consider the intimacy of this part a woman’s body, which was treated with such disregard. Some were subject to repeated biopsies, to the extent that their cervices were so mutilated further cervical smears were impossible. That meant no way to track cancer progression until cancer later appeared. You may have already read elsewhere another shocking part of the tale, that Green authorised smears from over 2,000 newborn baby girls, often without the consent or knowledge of their mothers, to try to prove his point that CIS was endemic in some women from birth and wasn’t linked to cancer. Spoilers: he was wrong. As horrible as these details are to read, they’re an essential part of the story. These revisionists who paint Green in a positive light could do with facing the reality of the lack of care he provided his patients and the bull-headedness with which he refused to change his mind in the face of conflicting evidence: a cardinal sin in the scientific method. I’ve always supported the maxim of historians: if we forget our history we’re doomed to repeat it. The unfortunate experiment is part of our history, a frightening part, but when Jones lays out the timeline of what happened and the personalities involved, it’s easy to see how the science and medical community at the time was set up to allow such a mistake to first occur and then go on unbridled for so long. Jones’ tale is one of big personalities; the old boys’ club that protected its own; a patriarchal and paternalistic attitude toward patients; misplaced and misguided loyalty; an arrogance that didn’t allow for the consideration of being wrong. Green is described by many as a towering man, with a booming voice and a temper. He was indignant towards critics, especially Jones’ co-author McIndoe who performed follow-up colposcopy on all women at National Women’s with abnormal smears, including Green’s patients. Reading Doctors in Denial I found myself often contemplating the power dynamics, where an older, dominant professor was almost entirely unchallenged despite many quietly thinking he was wrong. Science, and medicine, must be critical of itself. That doesn’t just mean thorough peer review and ethics committees, but also calling out bad behaviour and – in the most serious situations – acting as whistleblowers. It’s essential that we break down any remaining power imbalances, misguided loyalties and protective old boys’ clubs to ensure the kind of behaviour Green, and his senior colleagues at National Women’s, showed is recognised and stopped before it becomes dangerous. Jones’ book is a stark reminder why. On a personal note, as I read Doctors in Denial I was awaiting results from a follow-up smear (low-grade abnormal changes). As a woman in my early 30s, now with several abnormal smear results, I wonder if I would have been in the range for Green’s experiment. I consider now the trust I hold in my GP, whom I’ve known since I was 16. I trust that she will tell me the truth, even if it is uncomfortable; I trust that she will treat me like an adult who can handle the information she might need to give me; that she will refer me to a gynaecologist who will also treat me with respect and dignity; that my needs will be elevated well above the personalities and egos of any doctors involved. I can’t imagine a time when a woman walked into National Women’s Hospital unable to expect the same treatment. How could you trust the medical profession if that was you, or a family member, who was treated with such ill regard? For those who could have stopped it, and those who insist on revising the history, it’s an insult to the women and their families who were subjected to such inhuman treatment. I think Jones should be commended for writing this book and getting his recollections and experiences down. It’s well worth picking up, especially as all royalties from the sale of the book will be donated for gynaecological cancer care and research. Doctors in Denial shows great respect for the women with the grave misfortune to cross paths with Green and while the subject makes for tough reading, it is worth it to ensure enough of us remember our history. Featured image: Pap smear, Ed Uthman, Flickr CC. It should not be assumed that the Unfortunate Experiment was a single blight in an otherwise exemplary career for Professor Green. My mother received a hurtful judgmental and anti-female comment from him in 1967 following an unsuccessful pregnancy (what would have been my younger brother died in the womb a day or so before the birth). I suspect there may be a track record through his career of what would now be regarded as unprofessional behaviour. Yes I agree, Ross. There are other incidents discussed early in the book, especially regarding his views in abortion and tubal ligation/sterilisation where he clearly thought he knew better than his colleagues or patients. There was a clear pattern of arrogance and lack of care for his patients. What a terrible thing for your mother to go through and then to have a doctor make such a comment. Awful.